Since SOIL is known as the soul of infinite life, continued maintenance of good soil health is vital to agriculture production and nation’s economy. Despite the indisputable role of soil for the health of Human being, animal and plant life, there has been very little concern about soil health care. Soil health is the capacity of the soil to sustain biological productivity, maintain environment quality and promote plant and animal health. It is the fitness of the soil for specific use. The emerging complex challenges of maintaining good health of the precious, scare and shirking soil resource for sustained high productivity under the current and projected unprecedented pressure are enormous, but their cost-effective, eco-friendly, farmer-friendly and scientifically sound solutions will be amply rewarding in terms of food security, environmental safety and over all human welfare. To maintain soil resource in good health, mass awareness among the farmers and others stakeholders about the value of the soil health is of utmost importance. Government of India has been implementing a scheme on Soil Health Management (SHM) to take care of soil test based nutrient management at farm level. 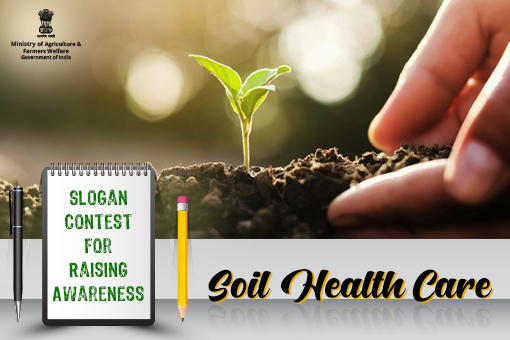 All citizens / stakeholders are invited to participate in raising awareness about the soil health care. You can do this by Slogans Contest on the aforementioned captioned theme.